Before anything, we stand with the good people of the French republic, as any normal and decent human being living in these times should. However. It has not been one full year since the Charlie Habdo slaughter, it has not been three years since Muslim fanatics murdered a young blond haired girl at the yard at her school by pulling her hair and executing her. France has been fully aware of the threat of ISIS and all other muslim groups and has done little to stop them from operating in France, whatever little they did do failed miserably last night in Paris. The failure to know your enemy, to realize who it is, what it wants and how he plans to get it is so fundamental to any struggle and yet the French has done nothing to try and advance on that front. Religious fanatics, coming from the Islam religion, are not even called what they are on the media, they are “attackers”, their victims have “died” and not “murdered”. There is no doubt, a culture that will not stand up and defend itself is not worthy of life – the France republic is heading this way and fast. So, it is no longer “just the Jews” or “just those freedom loving caricaturists in Charlie Hebdo”, its everyone, all the time – in practically any country in Europe. 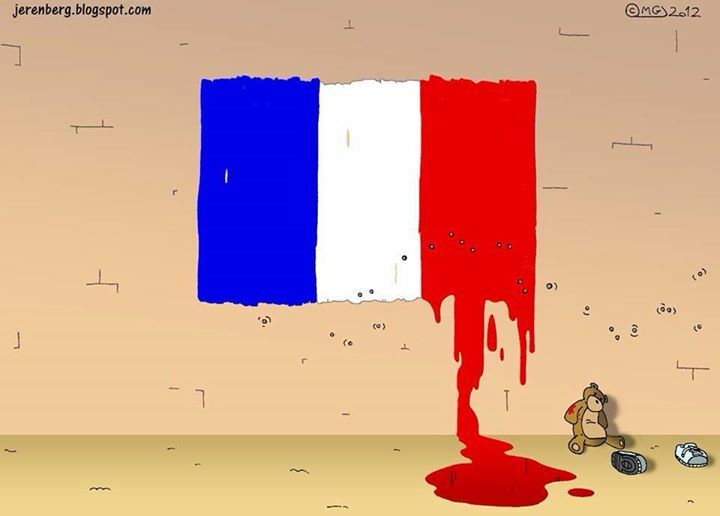 It has always been that way – but the French diluted themselves into thinking that they would dodge this bullet, by being nice, by sympathizing with terrorists in other countries, because some terror is somehow justified ??? And now its time to pay up, and as always it is the worst possible time because Europe had just introduced hundreds of thousands of Islamic immigrants into its very heart, without records, papers or any idea who these people are. These people will now add to the already existing multitude of European citizens who actively plan to carry out attacks against their own neighbors and the country they live in. If there was ever a time for militant atheism it is right now, incorporate it into your laws France, step up to the challenge, take your religious citizens and demand of them a clear stand – are you with a secular, democratic republic or are you with you blood lustful god?.